On 2nd June, astronomer, author, speaker, and researcher Dr. Danny Faulkner gave a talk on the reasons for believing in the six day creation account of the Bible versus the Big Bang theory. Filled with scientific and technical facts, Dr. Faulkner began by explaining why he is not convinced that the Big Bang theory is a reliable one. To provide some background context, he first introduced the Ptolemaic model: A geocentric model of the universe that was proposed by Ptolemy, a Greco-Egyptian mathematician, astronomer, geographer and astrologer, in early 2nd Century BC. A crash course on the history of cosmology. Ptolemy suggested that the sun, moon, and the five planets that are visible to our naked eye (Mercury, Venus, Mars, Jupiter, and Saturn) revolve around Earth on individual epicycles. While the theory seemed simple and straightforward enough, the data collected often had discrepancies. So in order for the model to fit the data, they would add more and more epicycles to the systems, eventually making it very complex. By the 16th Century, the Ptolemaic model had over a hundred epicycles in a single system. The strength of this model was that there was no way to disprove it. It was flexible—modifiable. If the data did not fit, the rules just had to be adjusted a little so it would. But that strength was also its weakness. Science has to be disprovable, and the complexity of this model led to its downfall as more and more people began to realize that nature is actually quite simple. The heliocentric model that the Earth is just one of the many planets orbiting the Sun was then discovered and gained popularity quickly due to its simplicity. By the middle part of the 17th Century, virtually everybody believed in the heliocentric theory. In terms of longevity, the Ptolemaic model is the most successful model of the universe in the history of science. It was widely accepted for 1500 years as the correct representation of our cosmos to the extent that it was eventually absorbed into the doctrine of the Roman Catholic Church. To doubt this model at that time was to literally go against the authority of the Church. But the model was based on the science of the day and not Scripture, which is a dangerous path for us who profess to believe in Christ, because we end up interpreting Scripture according to our understanding of science rather than the other way around. In the mid 1920s, Edwin Hubble proved that there were other galaxies. Five years later, he provided evidence that the universe is expanding—that things are getting farther and farther apart, thus suggesting that the things in the universe were closer together in the past. In 1929, he measured the speed of the expansion and found a linear relationship between the distance of the object (from the center of the universe) and its speed. The greater the distance, the faster the speed of expansion. Based on these findings, Georges Lemaître, a Belgium priest and theoretical physicist, extrapolated the data and hypothesized that the universe used to be much smaller and therefore, denser—which also means that it would have been very, very hot. 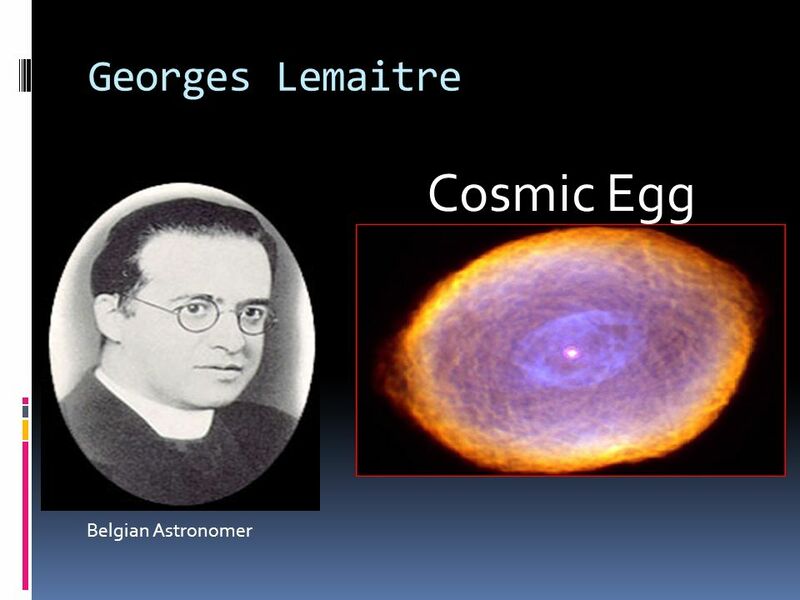 He called his theory the Primeval Atom, or Cosmic Egg, and believed that it was the way that God created the universe. His proposition was primitive and naïve, but became the kernel of what became the Big Bang model several decades later. So what exactly is the Big Bang theory? It is the notion that the universe began in an ultra hot, ultra dense state, and is constantly expanding. As it expands, it cools. Over the course of billions of years, stars, galaxies, planets, and people were formed. Interestingly, the Big Bang theory was met with much push back in its earlier stages because it suggests that the universe has a beginning. Since the time of the ancient Greeks, the universe was thought to be eternal. For it to have a beginning would call for it to have a creator, and such a thinking was just absurd. It was well into the 20th Century before people began to think differently, and it all changed in 1965 with the discovery of the Cosmic Microwave Background (CMB). It was discovered by accident and became the big, convincing evidence for the Big Bang model. Temperature fluctuations from the CMB supposedly come from a time when the universe was very hot and dense. The universe has since stretched and expanded and is therefore a lot cooler than it used to be, but the CMB is the left over thermal radiation that we can still detect. However, there have been problems with the CMB including the inability to find substantial temperature fluctuations that would fit the Big Bang model, the horizon problem in which the CMB has the same temperature (to a very high degree of accuracy) in every direction, and mysteries involving geometry and energy ratios in the universe (flatness problem). To fix the problem of the lack of temperature fluctuations, alterations were made to the model to fit the data. As a way to circumvent the horizon and flatness problems, the concept of cosmic inflation was developed. Every astronomer and cosmologist who subscribes to the Big Bang model believes in the cosmic inflation because the Big Bang model would not work without it. Yet, there is no evidence for it, and as it was with the Ptolemaic model, it is not falsifiable. With the dominance of the Big Bang theory in recent years, many Christians believe that they see the Genesis account in the Big Bang. They conclude that since the Bible says that there was a beginning and a creator, and the Big Bang says that there was a beginning (and therefore a creator), God must have created the Big Bang. Some Christians have even argued for the Big Bang model to be an effective evangelistic tool: God exists, and therefore people will come to salvation. But wouldn’t people of other faiths be able to say the same thing and claim for the creator to be their god? Therefore, before we jump the gun, there are several vital things to take into consideration. Reconciling the Big Bang theory with Christianity. 1. Is the Big Bang theory even true? If it is not, should we be building our evangelistic message on falsehood? If we look at the Big Bang model 30 years ago, it was very different. Back in the early 1990s, they changed the expansion rate, which changed the age of the universe tremendously. It went from 16-18 billion years to about 13.8 billion years. There was also no inflation back then. It was being suggested, but people didn’t really include it into the theory until the 1980s. Today, scientists wouldn’t dream of having a Big Bang model without inflation, dark matter, dark energy (discovered in 1998), or string theory. So 30 years ago, scientists had complete confidence in the Big Bang theory of their day. Now, they have complete confidence in the Big Bang theory of today. But if we compare the two, they are completely different theories. What we have now is apparently the correct version of it. But what will it look like in another 30 years? “Well I don’t know,” Dr. Faulkner said, “but I know two things: It will be very different, and they will have complete confidence in the theory!” It is starting to look like epicycles all over again, and some scientists are beginning to reconsider the model. It is beginning to become too complicated and unfalsifiable. “It is bad science, if it’s science at all,” Dr. Faulkner stated. 2. More importantly, is it Biblical? How does the Big Bang compare to Scripture? 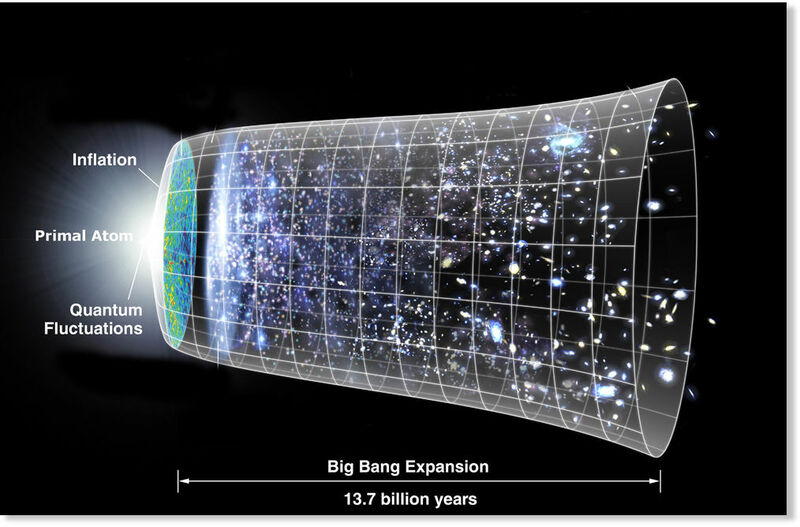 The Big Bang model says that the universe began 13.8 billion years ago. Based on calculations from the genealogies provided in Scripture, creation dates back to only about 6000 years. The Bible says the universe was created in six 24-hour days and that the stars were created on the fourth day after the Earth was already made. The Big Bang model suggests that Earth is 4.5 billion years old as compared to the 13.8 billion-year-old universe, and that between the formation of the universe and the formation of Earth, billions and billions of stars were formed over the course of 9 billion years. The Bible tells us that the work of creation is done. Finished. The Big Bang model claims that the formation of the universe is an on-going process. The Big Bang theory does not fit into the creation account of the Bible, and to try to do so would require some serious reworking of Scripture. It is unfortunate that many people end up trying to reinterpret Scripture in terms of what science is saying. But the history of science is such that ideas are rejected. Just like the Ptolemaic model, theories are eventually discarded. When that happens with the Big Bang, Christians who have totally wrapped their understanding of creation around the Big Bang are bound to discredit Scripture as certainly as the people 400 years ago when they were betting on the Ptolemaic model to be truth. 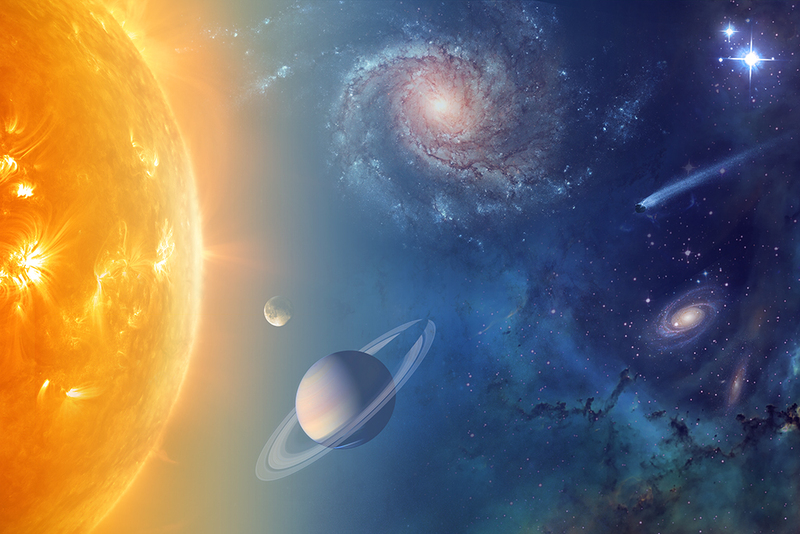 What is the Biblical Cosmology? When reading ancient texts such as the Bible, it is important to remember that many of our concepts today are modern. We use words like (outer) space. The Hebrew word for “expanse” is raqia. Dr. Faulkner pointed out that our understanding of these waters is essential to determining what raqia is. Older translations of the Bible uses the word “firmament.” In this passage, we see that God called the raqia Heaven. The “expanse of the heavens” is mentioned three times in the making of astronomical bodies on Day 4. It is as if God is telling us this is the raqia that He created on Day 2 and equated with heaven is the place where astronomical bodies are. Today, we call it (outer) space. 1. The universe has an edge. The raqia’s purpose was to separate the waters above and the waters below. That means that the raqia comes to an end! 2. There is a center to the universe, and Earth is somewhere in the middle or close to the middle. And the universe is stretched out from the center. 3. There is possibly water at the edge of the universe. If the raqia is a space separating water from water, which would mean that there could be a shell of water surrounding the universe! Water is a normal matter. The third law of thermodynamics demands that water has temperature, and if there is any temperature at all, it must radiate—it must give out some sort of light. Water surrounding the universe would account for uniform radiation coming from all directions. Hence the CMB is not an issue for the creationist. *Note: This is still a developing theory and it was only the third time Dr. Faulkner was introducing it to an audience. Lastly, Dr. Faulkner addressed the light-travel time problem in relation to the six-day creation model. Stars in the universe clump together in galaxies. Each galaxy contains a few billion stars. Through our telescopes, we are able to view galaxies as far as 300 million light years away. In other words, light from these distant galaxies take 300 million years (travelling at the speed of light) to reach us. Here’s the problem. The closest star outside of our solar system is 4 light years away. But we believe that God made the stars on Day 4, and man on Day 6. With only two days in between the creation of stars and the creation of Adam and Eve, it would have been scientifically impossible for Adam and Eve to have seen stars in their night sky until at least 4 years later. Yet, we believe that Adam and Eve did see stars, as everything God made during those six days of creation were fully functioning. He set the stars in the expanse to be light and their function would not have been fulfilled if Adam and Eve could not see them. Dr. Faulkner briefly described some attempts to resolve this problem, but came to the conclusion that none of them was quite convincing enough. He has since come up with his own theory that would solve both Adam’s problem (of seeing any stars at all) as well as ours (of seeing stars 300 million light years away). On Day 3 of creation, God created dry land and from it, He brought forth vegetation. The words used in all the different translations, including the original Hebrew text, gives the impression that the plants literally came shooting out of the ground, much like what we see today in time-lapse videos. God had to mature these very quickly so that they could fulfill their function of feeding the animals and humans He would make on Day 6. At the most, the trees had 2 days to grow to full fruition. The same understanding can therefore be applied to the rapid formation of the stars and a rapid extension of light to Earth. If we believe that God could speed up the growth for plants, why couldn’t God supercede the laws of science with light? Dr. Faulkner concluded the evening with the sharing of the Gospel, saying that believing in the creation model would mean nothing if one did not have a personal relationship with the Lord Jesus Christ as we are all in need of redemption. He believes that even the astronomical world is under the taint of man’s sin, which would be restored with the new heaven and new earth. For creation apologetics speaking engagements in Malaysia, do visit www.answersacademy.info or contact Joseph Tan at joseph@answersacademy.info. Do Human and Dinosaur Live Together?